Both collections belong to the archival legacy of the RFE Polish Underground Publications (PUP) unit, an autonomous section within RFE/RL whose function was to obtain, monitor and analyze press and other materials circulating without official consent within the vast independent publishing networks in Poland of the 1980s. In terms of both scope and content, these collections together constitute one of the most valuable elements of OSA’s Cold War holdings. The PUP’s principal purpose was to create publications based on the underground press for use by RFE’s Polish broadcast department and other national sections, as well as interested parties in academia and the Western press. Within the digitized publications collection, Polish Underground Extracts (PUE) represent probably the largest existing corpus of English materials on independent political life in Poland under General Jaruzelski, and a similarly vast array of Polish-language articles is contained in the Polish Independent Press Summary (PIPS). In addition, for the English language reader, the Polish Independent Press Review (PIPR) presents topical reviews on a variety of matters, including the best-known chapters from recent Polish history (Solidarity, the Church and leading dissidents), as well as many topics which today are either forgotten or neglected, such as cultural dissent, pacifism and environmentalism, the leading titles of the underground press, popular culture, economic matters, and attitudes to Eastern and Western neighbors. 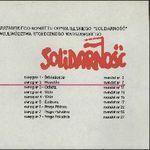 The unit’s collection of 1980s ephemera -- stamps, envelopes, postmarks and postcards, banknotes, calendars, photos, fliers and posters, produced by the underground and distributed independently -- illustrates one of the most interesting chapters in the visual history of dissent under Communism. The most extraordinary part of the digitized series is the independent postage. Despite the high prices, the risk involved and the absence of a collectors’ market proper (one not based on personal contacts), collecting independent postage was popular not only among underground activists, but also the population at large. Philately as an act of resistance was less risky than reading underground press or engaging in activism, and perhaps more emotionally gratifying. The aesthetics of independent postage consisted of simple but powerful signs, often borrowing from national and religious iconography, which imparted an immediate sense of symbolic unity to collectors. The same aesthetics and purpose apply to other types of ephemera in the collection: calendars, fake banknotes, as well as the more common “genre” of political prints – propaganda posters and leaflets.